Ladies and gentlemen, welcome to a Saturday Night edition of TCfOS! Tonight, we're looking at the Home of the Rookie Card. Or, at least that is what it says on the pack. Let's see if that holds up. 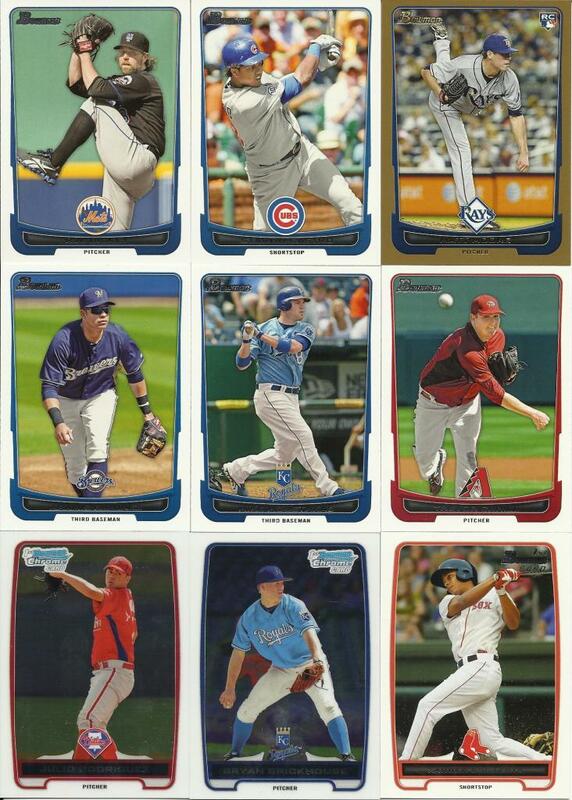 2012 Bowman. 10 cards per pack, 2 of which are Chrome. Again, according to the pack. Lookie there, folks! We've got a nice spread of players picked by several different managers plus a handful of Free Agents to go with them. Both Chrome cards turned out to be free for the taking next go-round, so we'll see who tries to snag either of those guys up. Thanks for playing along! Tomorrow, at least at the time of this post, is Mother's Day! So, Here's a special Tribecards WAHOO!! for any of my readers who happen to be mothers and/or it goes out to each of your mothers! Without our Moms, we wouldn't be here to enjoy the pack breaks. More on Moms tomorrow, though. Have a good night and drive safely.